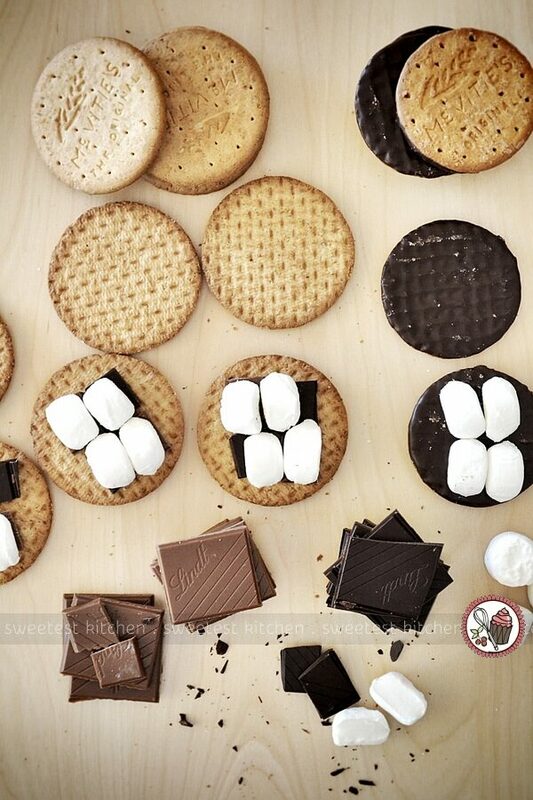 How to make s’mores, for those who live where graham crackers do not exist. It’s just past sunset. The air is cooling quickly on this autumn evening. We’ve made a spontaneous decision to have dinner over a campfire, so mom and dad are packing the necessities in the back of dad’s black Ford Ranger that I’ll always remember with its big rainbow “4×4” decal on the doors. I run off to tell my friends about the exciting news that we’re going to light a campfire; my friends are our two dogs, Missy (a Collie/coyote cross) and Mac (a Sheltie). They’re just as excited as I am. Mom calls for me and I hop into dad’s truck, next to dad. Mom sits on the other side of me, while Missy and Mac chase after the truck as dad drives into the woods. Dad parks his truck on the top of the hill overlooking our house. The view is splendid, although we can’t see much of it; it’s getting steadily darker as the sun falls further and further past the horizon. We gather some stones and arrange a roughly-shaped circle in the grass where our fire will be. Mom and I pick some branches off a tree (we choose fresh, moist branches) to use as roasting sticks and dad prepares the fire. We bring our stick collection to dad, who pulls out his pocket knife and begins to sharpen the ends of the sticks for poking our food onto. I take a look at our dinner – mom and dad have brought hot dogs, hot dog buns, potato chips, ketchup, mustard, drinks and, of course, marshmallows. The fire eventually grows bigger, brighter and warmer. Mom unfolds our lawn chairs so we can sit around the fire and warm up. Missy and Mac are running about, sniffing the trails of the rabbits, turkeys, coyotes and deer that inhabit our woods. Mom and I feel a little nervous; we’re spooked by all the strange sounds we hear in the dark around us – rustling in the weeds, twigs snapping. The dogs are also feeling a little paranoid, constantly sniffing the ground around us. I feel safe, though, because we have dad to protect us. Dad hands us our roasting sticks and we thread our hot dogs onto them to roast. I stand as far away from the fire as possible, doing a good impression of Inspector Gadget with my roasting stick hanging off the end of my extendo-arm; I am scared of getting burned! Mom and dad tell me not to worry as they roast their hot dogs until they’re black. I don’t like burnt dogs so I draw in my extendo-arm just before my hot dog is starting to blister. I carefully place the hot, hot dog into a bun, pour over the ketchup and relish (no mustard, please!) and bite into it. Mmmm. So much better than a microwaved or boiled hot dog. A campfire-roasted hot dog, roasted on a stick fresh from the tree, eaten under the stars and around the glow of a warm fire. I can’t think of a better way to eat my dinner. I munch the rest of my hot dog and chips while mom and dad finish roasting their own hot dogs. It’s very dark now, and although Missy and Mac have settled down, I still hear those strange noises. But mom and dad have finished their hot dogs and chips and it’s time to roast marshmallows. We each poke a column of marshmallows on our roasting sticks and suspend them over the fire. Again, I stand as far away as possible to avoid any sparks from the fire colliding with my skin. As with my hot dogs, I don’t like burned marshmallows, so I allow them to toast gently, just until they’re slightly brown. I pull my stick from the fire and test how soft the marshmallows are with my fingers. Yep, they’re ready to eat. Mom likes her marshmallows black, so she keeps hers over the fire. I tease her about how yucky the burnt taste is and then pull my browned marshmallows off the stick with my teeth. How delicious this is! The outside is crunchy and the inside is melty and gooey. I finish my column of marshmallows and then promptly align the next batch on my stick. After our second helpings of marshmallows, we pack dad’s truck up again with our gear, garbage and leftover food. Dad puts out the fire and we climb into the truck. Missy and Mac run back home, chasing the truck. When we get inside the house, I look out the window to the hill we had just come from. It’s so dark that I can’t even see it, but I don’t need to see it; that night, that experience, now has a permanent place in my memory. What a wonderful evening. A little cold, and a little scary, but who cares? You can’t beat a campfire dinner. And I can remember it just as if it happened, perhaps, a month ago. We may not have made s’mores over the fire (and now I wonder why on Earth we never did! ), but I have had plenty of s’mores in my lifetime. When you’re not able to make a fire, you have to devise other ways to make s’mores; I’ve made them in the microwave, the oven and yes, even over a candle. 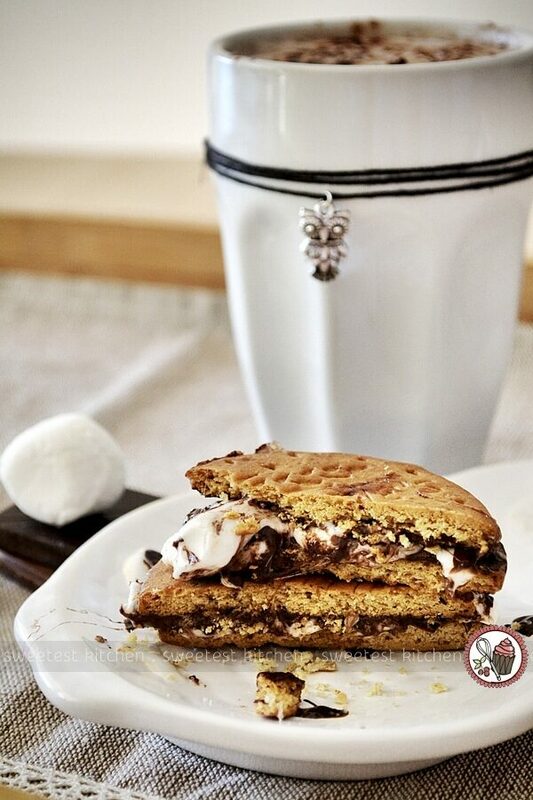 As you know, s’mores are a sandwich, of sorts, of graham crackers, melty chocolate and gooey marshmallows. 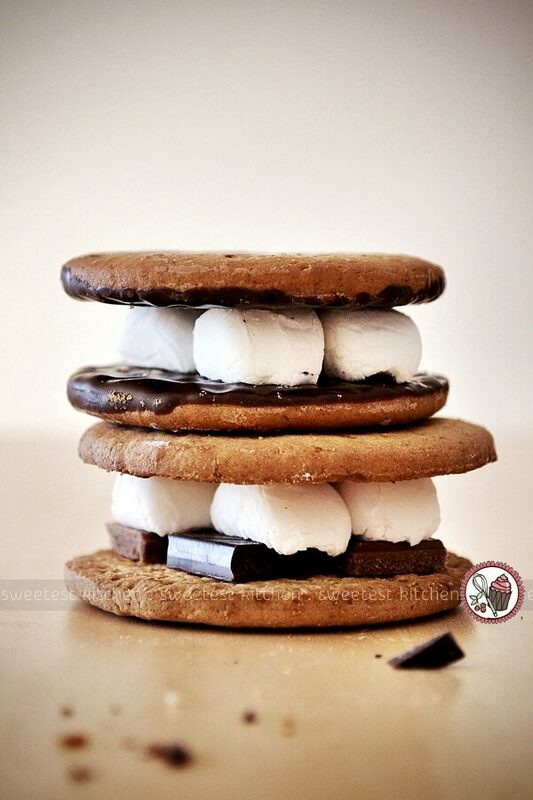 The first ever recorded recipe for s’mores, then known as “Some Mores”, is printed in the book Tramping and Trailing with the Girl Scouts, from 1927. S’mores are, indeed, a favorite American campfire treat; they’ve even got their own special day – August 10 is National S’mores Day! You may also know that I am American. Yes, I live in Australia, but my heart is American. I miss lots of things about the U.S. and s’mores is just one of those things. When I first moved here, I was saddened to learn that graham crackers did not exist in the Land Down Under. I had to make a request to my mom to send me some graham crackers once! Until I stumbled across a s’mores recipe on taste.com.au. 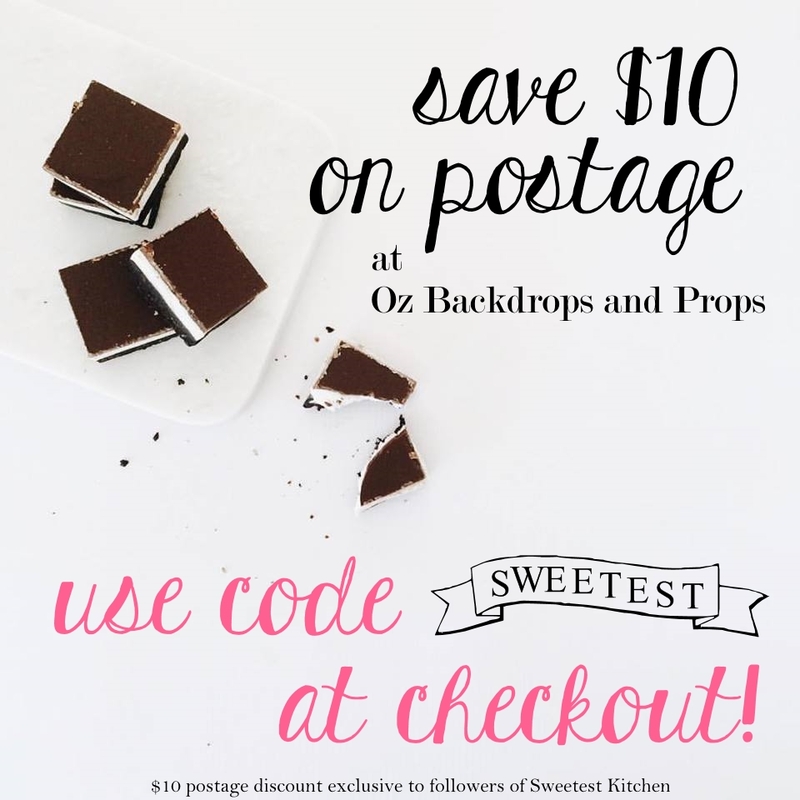 Of course the recipe was written by the lovely Valli Little, who else! I couldn’t believe she was making s’mores with digestive biscuits. I had no idea what a digestive biscuit was, or how it could possibly be used for s’mores. Sure, I had heard of digestive biscuits before, but I thought they were some sort of biscuit that was meant to aid in digestion and they’d taste icky and weird. I trusted Valli, however, and tested the recipe myself. When I brought home two packages of digestive biscuits – one coated in dark chocolate, the other plain – I quickly opened them and gave the biscuits a nibble. Hm. Oh yes, they could be used like graham crackers! They do actually taste similar! They weren’t icky and weird at all! And right there on the box was a disclaimer that these biscuits do not aid in digestion in any way whatsoever! So I made my first s’more in years, varying from Valli’s recipe a bit. I used the chocolate-coated biscuits and I used normal-sized white marshmallows. I made them in the microwave, not the oven. And wow. Delicious. Okay, it’s still not a traditional s’more, but it’s the closest I’m going to get, and I was very happy with it. For the purpose of this post, I went all out and made s’mores in the oven with both the chocolate-coated biscuits and plain biscuits. I’m sure you can tell which is which in the photos (the choc-coated is the s’more on top). I used a combination of Lindt chocolate in milk and 70% chocolate for the plain s’more. 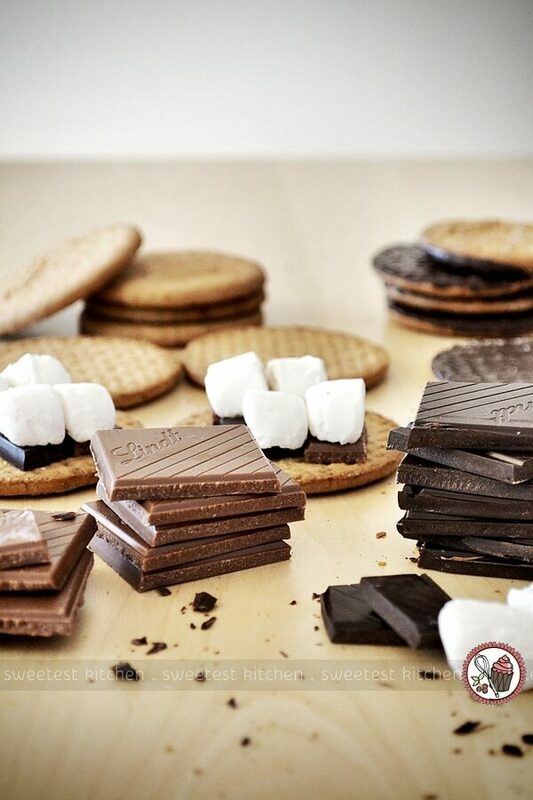 Side note – when making s’mores, if I’m using Lindt chocolate on a plain biscuit, I prefer milk chocolate. But, if I’m using the chocolate-coated biscuits to make s’mores, I prefer the dark chocolate-coated biscuits over the milk chocolate ones. So there, Australia. 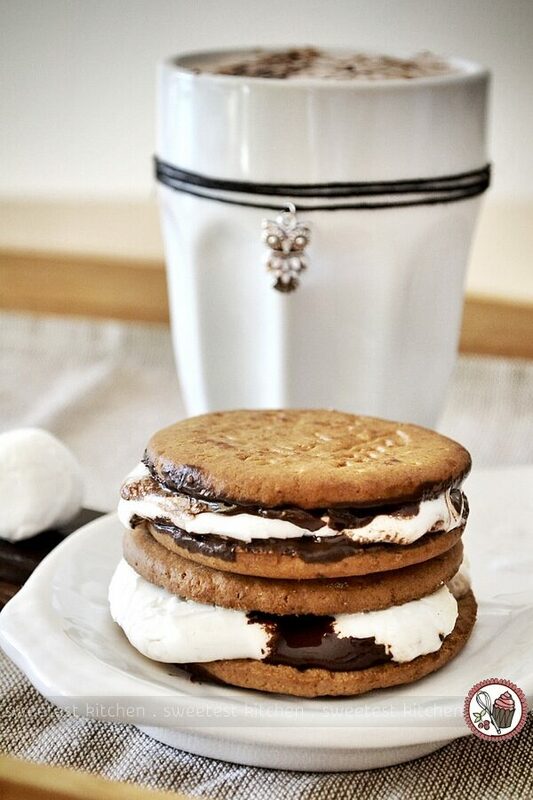 If you thought you’d never taste s’mores, give this recipe a go. It’s the perfect simple and indulgent treat and, without a doubt, would taste even better when the marshmallows are roasted over a campfire. 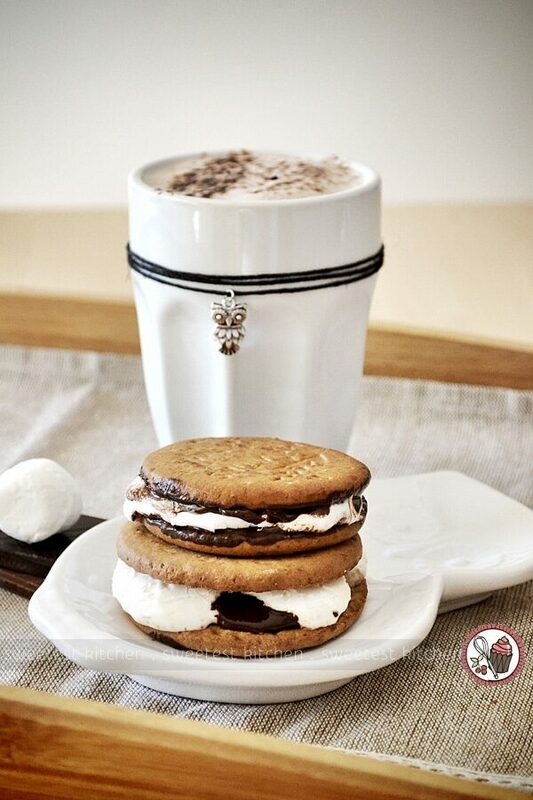 Tip: try adding a bit of peanut butter to your s’mores for even more taste indulgence! A simple recipe for how to make s'mores if graham crackers are not readily available in your area. Place 2 digestive biscuits, bottom side up, on a parchment paper-lined baking sheet. Break each square of chocolate into 4 smaller squares so that you have 8 small squares. Arrange 4 of these squares in the middle of the 2 biscuits, keeping them close together and as far from the edges of the biscuits as possible. Cut the marshmallows in half and arrange one marshmallow half on top of each chocolate square. 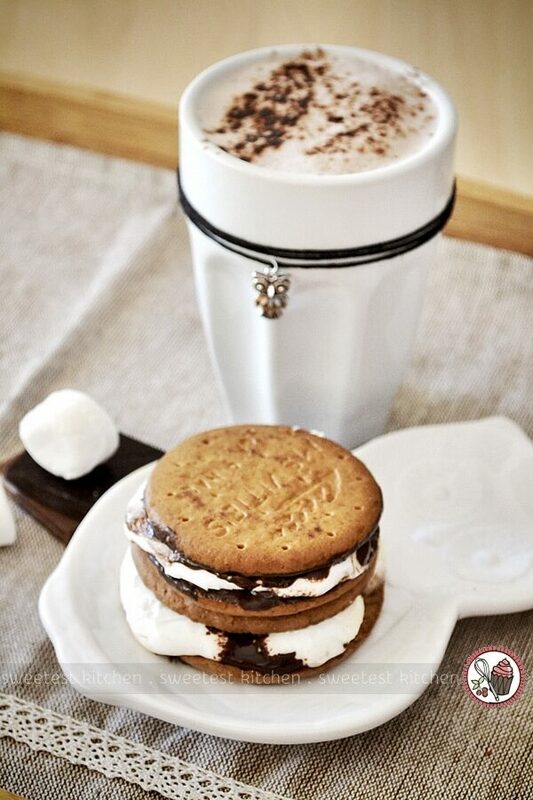 Place the other 2 digestive biscuits on top of the marshmallows. Place the tray in the oven and cook for 4-6 minutes, or just until the chocolate and marshmallows are melty and gooey. Keep your eye constantly on the oven while cooking because once the marshmallows start melting, they melt fast! - Alternatively, roast over a campfire! 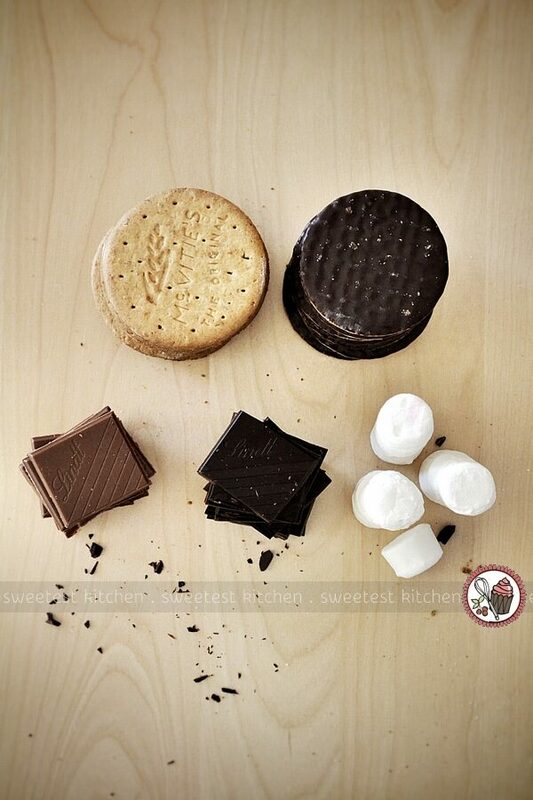 - To use chocolate-coated digestive biscuits, simply leave out the 2 squares of chocolate. The choc-coated biscuits melt faster in the oven, so keep that in mind while cooking. - For Valli Little's recipe, visit taste.com.au. She uses mini pink and white marshmallows and milk chocolate in her version. I wish I liked marshmallows! These look great but I can’t do marshmallows unfortunately. I’ve always been interested in what a graham cracker tasted like. Could you substitute digestives/wheatens for them in other recipes that call for graham crackers? Yes, I think you could substitute digestive biscuits for graham crackers; especially in s’mores recipes ( bars, cupcakes, etc), in pie crusts and in those recipes that use crumbed graham crackers in the filling (like peanut butter cups). They’re more similar than I thought they’d be, so I think they’d work quite well. Hi Kalliste! Just wanted you to know, that I too don’t ‘do’ marshmallows, chocolate or biscuits, but I tried S’mores when visiting expat friends in Canada and….I fell in love with them!!!! Honestly, like you, all of the ingredients are ‘wrong’ but somehow they work! Please, just try it, I promise you won’t regret it!!! marshmellows and campfires are a must! smores are a bonus! love this recipe thank you! I can very well believe you miss home…so many things are evocative of childhood aren’t they? I don’t think I could eat these, so sticky-sweet, but may I ask you a question? I’m fascinated by the language difference, with cookies/biscuits. I believe US biscuits are similar to Aussie/Brit scones? So what do people in the US call a biscuit joiner power tool. I hope not a cookie joiner! If you don’t happen to know, don’t worry… it just occured to me, because one of our carpenter friends has just acquired one… and… well… hmmm… wondering! I believe it’s called a plate joiner…. Answered my own question! Don’t you LUURRVE the internet? If you were to make them in the microwave, how long would you recommend cooking them for/what settings? Same as the oven? Hi Ash, definitely not the same as the oven! I usually make mine in the microwave if I can’t be bothered heating up the oven, and I usually lower the power setting to about 70%. The time it takes will vary, but for my 1100-watt microwave, the marshmallows start puffing up and becoming gooey after about 12 seconds. I am gonna try Chocolate Wheaten biscuits as they are covered in chocolate with a marshmallow in the microwave. If you read the labels on Ryvita crispbread (a Scandinavian invention) you may be surprised to find that they are called ‘Graham Crackers. “Graham is one of many ways of producing special flour. Just read your s’more recipe for living in Australia. You say that you found a cookie/biscuit to substitute graham wafers for pie crusts etc. Plz plz plz tell me what you use, I’ve been in Australia 14 yrs from the west coast is Canada and hate that graham wafers haven’t made it down under yet. Hi Sonja, I use either digestive biscuits, or Arnott’s Nice biscuits. Hi there, I made s’mores tonight for the 4th of July 🙂 I buy my honey graham crackers from Filipino Asian stores. Hope that helps! If you are diabetic, you can still enjoy these in moderation, if youkeep my trick up your sleeve. You can buy sugarless marshmallows and sugarless bars of chocolate from a large chemist chain, and use those with the digestive biscuits. If you want to be really decadent, you can also buy the marshmallows ready coated in chocolate. I like to drop 2 or 3 into my mug of coffee. Yummy!